Will Engine Software’s WiiWare debut give you much bang for your buck? Bang Attack is a puzzle game involving hammers, fruit and other random objects. The concept is very simple. 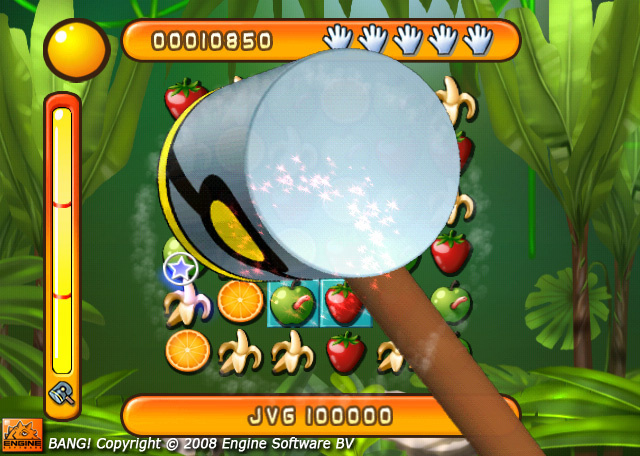 Your screen is loaded with refilling objects: fruit on the first level, seaside objects on the second level, etc. To clear the objects from the screen you must “hammer them” by pointing at them and pressing the “A” button. By clearing the foreground objects you slowly clear background panels. Once the background panels are all gone you move onto the next stage. Complete ten stages to move onto the next level. Repeat, ad nauseam. Fortunately, there are few twists to make the basic gameplay a tad more interesting. 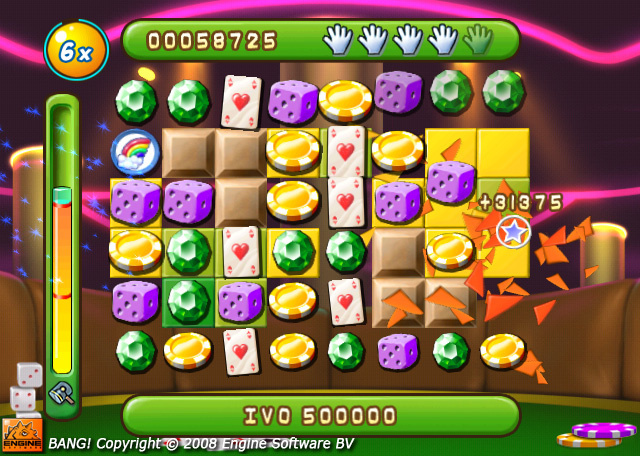 A multiplier mechanic is implemented that rewards you if you quickly and consistently clear the shapes without making a mistake. This is the “hook” that allows you to constantly improve on your high scores. There is also a power bar which gains in energy as you clear shapes, allowing you to make a swinging motion with the remote when full. This essentially clears the screen and thus gives you a whole new set of random shapes to work with. The final gameplay mechanic is the ability to throw away shapes that are blocking combinations. To do this you point at the shape you want to remove, grab it with the “B” button and flick the remote. You are only allowed to do this once for every few shapes you clear so you’re encouraged to use it wisely (if at all). In practice you will probably not feel the need to remove shapes from the grid, as it is only worth doing when you cannot see an obvious cluster of shapes to clear. The flicking mechanic feels extremely cumbersome and we found that it tends to break the flow of the game. 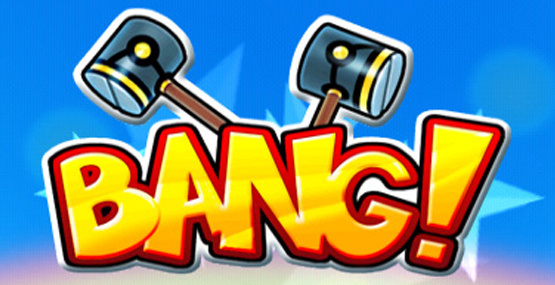 Aside from being utterly generic, the main problem with Bang Attack is that there is no challenge. Even after playing for an extended period the player is never put under pressure to complete the level because there is no time limit or a threat of “Game Over” -- nothing! You just keep plodding along through the levels until you inevitably get bored, at which point you are provided with an option to “End Session” and that’s it. You lose the game when you’re ready to lose it. 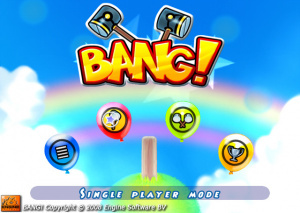 The graphics are plain and colourful, with bright blue backgrounds and colourful items on top. The music is also chirpy and addictive but after a while it becomes particularly irritating. It all suits the mood of the game well but feels so hollow and basic. You could easily compare it to a web browser Flash game or something you get preinstalled on your mobile phone; while never particularly doing anything wrong it fails to ever capture the imagination. Aside from the obligatory single player mode there is a multiplayer mode, which is essentially the single player mode with two people. The game keeps track on who has been earning the most points and congratulates the winner at the end before moving on. I predicted the score correctly - this was a real disappointment. The gameplay showed potential, but it would have benefited so much more if there was an element of challenge (since you can never lose) and if there were an endless mode. I don't think this game was ever going to compete with any puzzle game on WiiWare, for the one reason that it doesn't provide any challenge, what puzzle games were meant for in the first place. still not the worse game on WiiWare though. At least these poor quality shovelware games don't clog up physical space in an actual videogame retailer or prevent other games from being released. the only annoyance to us, the informed consumer is that it takes two seconds longer to browse through the list of games on the wii shop. its the uninformed consumer thats at risk of buying crap games (and to be honest there is a large amount of them on WiiWare based on reviews). Aw what a shame, I was considering getting this and expected it to get a 5 or 6 but a 4 is too low a score for me to even look at gameplay footage. I think there are enough puzzle games for WiiWare now and it seems like there will more disappointing ones like this in the future if things stay as they are. @BassX0: That same situation applies to every game console. "Golden Balls and Babysitting Party? Yes please! No - wait - the new Madabascar game! No - wait! DOLPHINZ!" I have to say, this was less than I expected, and I wasn't even expecting much in the first place. Just randomly hit blocks? No way to lose? No thanks. Pass. Once I saw a video of it in action, it looked so boring. This is disappointing when you considering how long we've been waiting for this to finally release on the service. I'm hoping it doesn't come out on Monday for us. Just going to stick with Art Style games. those are really the only good puzzle games that I play and really enjoy! Again it looks like a free web flash game and I would rather just play Art Style stuff. I didn't expect it to get a 4, at the end this one was the shovelware and not PCP, I'd rather get any of the ArtStyle games over this one. It looks like fun but it also looks like you'll get bored after playing 5 levels. It doesn't help that it looks like an average cell phone game. If it was priced 400 Wii Points or lower, I would bite (if it comes to US) but for now, I'll pass. @Shadows212: is BMBlast considered a puzzler? I'd say it falls into party, action or arcade genres over the puzzle one. To be honest, i wasn't expecting more than a 6 for this game and i have to agree with this review. Justifiable score considering what was said. I didn't realise you had your own website. I'll have a look on it. 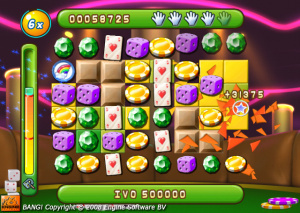 @Wiiloveit BMBlast is considered a puzzler. Why no clue. Maybe Nintendo loves puzzles. There's no way to lose!? @ Terranigma - I didn't know he had his own site either until the other day. It's a great site and one that I catch myself checking out quite often. And great review as always Sammy! It is a good site indeed. Will there be forums at some point Wiiloveit? Wiiloveit, I don't think you did a prediction, but a reviewed it yourself, no? I apologize, that certainly wasn't intended to be that way. Are you guys at WWW gunna do wiiware game of the year? I think it's pretty obvious which game would receive WiiWare Game of the Year on this site. Yeah I don't think there would be much anticipation about the winner of WW Game of the Year, do you? @Corbie-What if WoG wasn't allowed to be game of the year? Be like "Best Wiiware Game that's not World of Goo of 2008"
Hey maybe you should do a top ten WW game of the year. Of course we all know what #1 would be, but 2-10 would be a surprise. dont just do “game of the year” do other categories like best puzzler(obviously), racer, shooter, cheapest, etc. Yes, some kind of WWW top wiiware games list would be nice. I support the several categories idea. Nice site, sorry I didn't noticed the link the first time around , I was in a hurry; is great to have more reviews to read, and the way you started the link's one, lol... hilarious, keep it up. Worst WiiWare game should also be a category! This game can be added to the list of contenders. I think we were all hoping there would not be a need for a worst game list for WiiWare but alas... Don't know why Nintendo isn't more selective in the games they allow for their service ('Money, money, money' maybe, to quote a famous ABBA song). What I didn't see in the review was a mention of what exactly the different shapes mean. I suppose when you hammer an icon all adjacent panels of the same type disappear? Can you hammer any panel or is it limited in some way? @KDR_11k: You "hammer" clusters of three or more shapes that are touching horizontally or vertically. Hope that helps! @PALgamer: I predicted the score on the WWW Bang! page. As gameking said, I think a top ten would be good - and you could also do a user-based vote as well. @Terranigma: I'm looking into allowing user created comments on articles, and when the website popularity improves, I'll look into forums as well - I've got a lot of other work to do on it myself first. It's still a bit of a working progress and I'm looking for help because it's tricky managing almost the whole thing by myself. I especially need help with the design and whatnot - and I haven't the money to buy all the "big" Christmas games either. I still check back here regularly, and I'm not leaving you or anything! Ahhh OK, either way you did give it around a four on your website too. It's pretty cool, I didn't know there was a TV Show King Party, might buy it if it's cheap. @Terranigma: Wow, hold your horses, I was simply trying to lighten the conversation since I thought you where a bit hard on Corbie for a simple keyboard error and taking it out of context, seems like it didn't work. But I won't press the matter on, since it is a sore subject. If it has offended you, I'm very sorry!!! ...other than the fact that Engine Software wants you to pay for it. While there is certainly a glut of ridiculous puzzle games on Flash sites, the vast majority of those are available at no cost. The developers make their money off of sponsorships and the website (i.e. the sponsor) makes his money off the advertising. Here Engine is obviously trying to go directly to the consumer with a product that is unlikely to value at $6 in virtual currency. Moral of the story: When your game was previously worth $0.20-$0.30 per player in ad revenue, that is likely all that gamers will be willing to pay for it. I Would love to see a voting contest for best WiiWare game this year. That would be great to see what something other than sales chart say about the games. "I apologize, that certainly wasn't intended to be that way." I understand and accept your apology. I knew it was a simple spelling error. Also, if i seemed hard on you, then sorry. I tried to not make it sound like i was being hard on you. I just wanted it resolved quickly. What really ticked me off was what PALgamer said. I wasn't trying to be hard on Corbie. I honestly tried to make it sound like i wasn't being hard on him. As for lightening the conversation, please don't use that language again to try and do so. It did offend me as i have had racial problems before, on occasion having that word said against me. I understand how it was all a simple spelling mistake from Corbie and was ok with that. I just wanted it corrected but what you said really did touch a sore spot. I'll forgive you this time but please try to be more appropriate with your language. I've deleted the response now. Let's just move on from this. Ok, thanks for confirming that. The user comments will be a nice feature. Just wondering, will you have to register or can comments be left by anyone? I know you're concentrating on other stuff right now but I'm just curious. If nothing's been decided, don't worry. @Terranigma: that's erm... a surprise. @Corbie: Nice to know that you check out my site often - I feel honoured How's "Retro Rated" coming along anyway (I think that's what it was called)? Let's leave it at this: Corbie and PALgamer were both Silly Billy's. Period. And the winner for 2008 Wii Ware game of the year is..................Pong Toss by Frat Party games!!!!! What would be even better is, after the WW voting is over, the WW staff should put up a Youtube video announcing what games got the most votes, showing videos of the game in action as they go through the list, the percentage of votes obtained and information about the game and when we reach No.1, have like a dramatic drum roll in the way like how some Award shows will or big events that use public voting systems to keep us in suspense and then announce the winner in glorious fashion. That would be sweet. Just like an actual award show. If their were categories I'd put a limit to at most 5 games on those (unlucky Puzzle games). Just something to think about. If you do a best of 2008 WW contest, please consider my approach to revealing the winners. I should probably be focusing on other things right now though. I'm trying to help a friend get signatures for a petition my Friend created to stop The Asylum making "Mockbuster" movies based off major Hollywood films (It's similar to the Uwe Boll Petition). Maybe afterwards, he's said he will do one against DDI's beyond low quality Shovelware. Honestly, those games give Shovelware an even worse name. Retro Rated is now being worked on by several of the WiiWare World and VC-Reviews staff members, including me, Daz, and Anthony. We're shooting for an early 2009 launch of the site. We're very excited about it, but for now we're keeping details to a minimum until we've finalized everything. Trust me, you guys will be the first to know when we get it all going. If it turns out the way we're hoping, it could be a mammoth classic gaming review site going all the way back to the Atari 2600 era. We'll see how things unfold. @Corbie: So it's basically VC-Reviews, but including a helluva lot more consoles? That's pretty much it. Only we won't have to wait around on releases in order to add new reviews. We're pretty excited about the prospect of the site and as I said above, we'll have more details about it when we've decided on all the things we want to implement. With reviews, will you use the ones from VC-Reviews or are they new ones? I didn't have much faith in this game anyway. Just another puzzler. Hopefully Big Kahuna Party will fill the void of exploding-block puzzlers on Wiiware. @Terranigma. I think maybe they'll make new reviews, with different people reviewing, like have Dazza review a game Corbie reviewed on VC-R.
btw, what's your new avatar? It looks like Japanese Power Rangers. Better never than late in this case, eh America? Nope and 100 points less than NoE had to pay so, a positive for some.